While Nininahazwe may not call herself a modern day globetrotter, she’s definitely collected her fair share of travel miles – all in the name of education. Nininahazwe is from the Republic of Burundi, a country in East Africa bordered by Rwanda to the north, Tanzania to the east and south and the Democratic Republic of the Congo to the west. It’s roughly 8,000 miles from St. Louis. 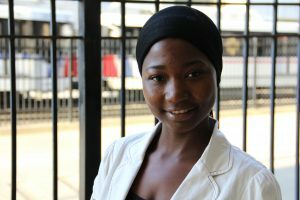 Nininahazwe traveled far to study accounting at the St. Louis Community College – Forest Park campus, and she rides MetroBus and MetroLink to get to class each day. Her commute to school starts with boarding either the #8 Bates-Morganford, #10 Gravois-Lindell or #73 Carondelet MetroBus on Tucker Boulvard and riding the bus to the Civic Center Transit Center. From there, she boards a westbound train to the Central West End MetroLink Station, where she catches the #59 Dogtown to get to campus. She’s been putting this commute to use for the last two semesters. “Metro is the easy way to get around town,” she said. And since she’s a student, it also saves her money. St. Louis Community College recently joined the Metro U-Pass program in August. Students like Nininahazwe can use the U-Pass program for unlimited use of MetroBus and MetroLink each semester. The U-Pass is paid for through the college activity fee and comes at no additional cost, making it easy for Nininahazwe to read or sit back and relax while traveling around the area. “It’s easy for me to catch a bus and do my homework at school and then go back home anytime I want,” she said.